Copper fungicides are used to prevent certain bacterial and fungal infections of tomato plants that commonly occur in cool, wet weather. They are applied before infection, not after. In order to be effective, copper fungicide sprays must cover all the surfaces of the tomato plants, including the bottoms of the leaves. Agronomists at Purdue University recommend copper fungicides to combat bacterial canker and leaf mold on tomato plants; copper fungicides are also used against anthracnose, early blight and septoria leaf spot, but other fungicides are more useful. Plant pathologists at Clemson University recommend copper fungicide as a preventative treatment for bacterial spot, early blight, late blight and Buckeye rot on tomato plants. Copper fungicides are especially recommended as a way of preventing late blight (Phytophthora infestans), a pernicious bacterial disease that strikes tomatoes. Late blight appears as dark, water-soaked spots from nickel-size to the size of a quarter on the leaves and tomatoes. There are more of these spots after rain or dew, and the spots can become covered with a layer of white fungal spores. Both tomatoes on the plant and those that have been harvested develop large brown spots. Agronomists at the University of Vermont say if wet weather persists, the fungicides should be applied again every five to seven days. The National Organic Program National List approves copper fungicides if they are used in a way that does not result in the accumulation of copper in the soil. Copper fungicides are synthetic; growers are encouraged to use all available cultural practices before using them. When copper fungicides are used the soil should be tested periodically to ensure that copper is not accumulating in the soil. Agronomists at Cornell University say bacteria are appearing that are resistant to copper fungicides. This can be overcome by using formulations that contain more copper mixed with water that is not acidic. The copper fungicide and water should be mixed in the tank with an EBDC fungicide and agitated for 90 minutes before spraying on tomatoes. 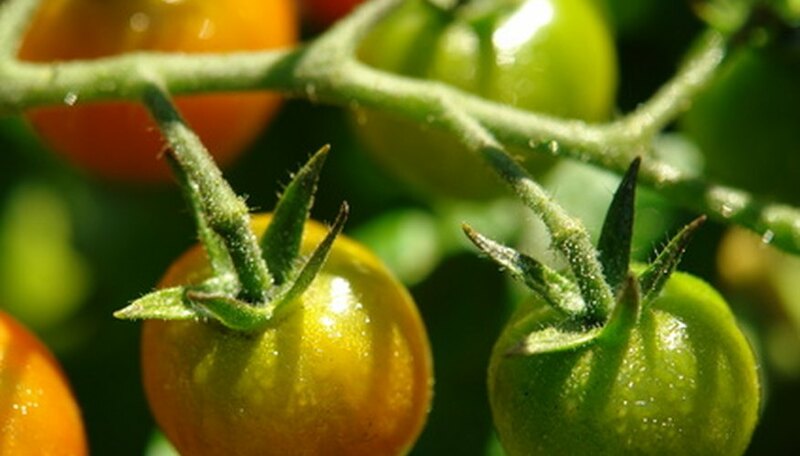 EBDC, ethytlene bisidithiocarbamate, is a protectant fungicide that remains on the leaves as residues, requiring the tomatoes to be washed before they are eaten. Copper does not break down in the soil; it accumulates. The European Union restricts the use of copper fungicides to 5.4 pounds per acre if they are applied annually to perennial crops. They are banned in Denmark and the Netherlands. Agronomists at Oregon State University say copper fungicides should only used every four to six years when crops are rotated annually. After three to 15 years of spraying grapes with the Bordeaux mixture containing copper sulfate, vineyard workers developed liver disease. Long-term exposure to low levels of copper can cause anemia. If copper fungicides are applied to plants in large doses at high temperatures it can cause leaves to wilt and dry up. It may result in fewer tomatoes and can even kill tomato plants. Copper sulfate is highly toxic to trout and other fish as well as crabs, oysters and shrimp. It is less toxic in hard water and affects young fish more than fish eggs.